As some of us at HindSite get ready to head up to our hockey-loving, Ps-&-Qs-minding neighbor to the north for Landscape Ontario’s Congress (Canada’s largest green industry trade show). 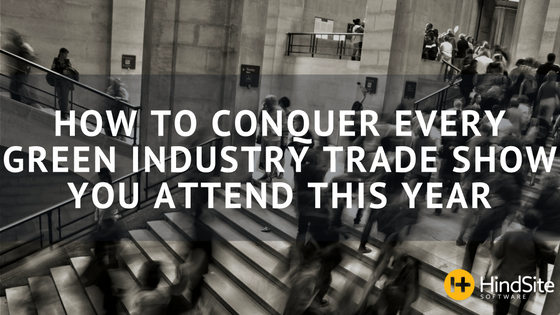 There’s been some chatter around the office on best practices of attending trade show. From educational sessions to new industry products to valuable connections - when done right – you can walk away with a head full of bottom-line-boosting knowledge. Having trouble finding events? Check out our 2017 Green Industry Trade Shows, Expos & Events Calendar to find one near you. Before hopping on the plane or jumping in the car, do a little reconnaissance, check out the info. Most conferences will release an app that includes everything you need - from the lay of the land to the schedule of sessions - to make your best plan of attack. Doing your homework allows you to spend more time gathering useful and wallet with business cards and less time wearing out your shoes. Speaking of shoes, make sure you bring a comfortable pair. For you that might mean the classic and dependable New Balance 608s (The Ultimate Dad Shoe) or a spongy pair of florescent orange Crocs. Just make sure the shoe can handle the long haul because putting in 5 plus miles a day isn’t unheard of. This will be a valuable tool throughout the event because as you’ll see networking is the most important thing you can constantly be doing throughout the event. Share them with vendors, speaker, peers, anyone you connect with because sometimes it’s this rectangle of card stock paper that triggers somebody’s memory. As a field service software vendor who typically only contacts customers and potential customers over the phone. Trade shows provide us the opportunity to get in front of people and put faces to names. Come prepared with a list of vendors you want to talk to, talk to them, and then walk the floor and see if anyone else stands out, and go talk to them. Hit up their after-hours events. Vendors are always putting on events after hours. Go to a couple. It’s a great way to meet new people, see new sites, and get some free food and drinks. It’s also a great place to learn how you can improve your business from peers and vendors. Knowledge is power, and there’s so much to learn at every session. Try to figure out which one can help you grow and improve your business. They have the potential to provide that one tip or idea to spark a business. But even if you end up going to a session with an irrelevant subject and terrible speaker you at least learn how not to speak in public. It’s the most important part of any green industry event. All the other stuff is great, it can add great value to you and your business but the people who spend as much time as possible networking are the ones who get the most out of trade shows. This doesn’t mean you have to be that guy with the incessant handshaking and business-card-presenting who everyone tries to avoid. Your goal at every trade show should be to find a non-competing peer who you can bounce ideas off, talk through problems with or just bs about stories you can both relate to. Whether they’re a wise mentor or vice versa, having the chance to talk things out will improve your thinking, business and occasionally your sanity. If you’re doing trade shows right, there might come a time when you start dragging a bit. Whether there’s a lull in the action or you just want a change in scenery - you can always explore the city around you. Go to a baseball game. Walk around an interesting neighborhood. Do some tourist activities. Working 80-100 hours a week is draining, so take a day here or there to enjoy the fruits of your labor. It’s something we’re all guilty of, no matter the industry: you attend a trade show or expo - have a great time, learn a pile of new stuff, see a few great products that strike your interest, connect with a bunch of knowledgeable people - then that Monday comes around and you’re back to the grind. Your attention is needed elsewhere. You have a business to run. There’s work be done. It happens to us all, including myself. But this can change. It all starts by making a concerted effort. Set a timeline for completing a minor task that moves you towards achieving a greater goal. For example, you could start with simply determining if your business would benefit from one of the new processes or ideas learned at an expo. If it would, then you move on to the next step and set aside time to plan how it could be put into action. If it wouldn’t then that’s-that, you’re done. Now that you know the when, where and how. Find the green industry event (or events) that perks you interest. We hope to see you there!